Bryan, Jen, & the 3 Henchmen: Fire! Well, Friday evening Bryan, Timothy, and I ran a few errands and then we decided to eat dinner at Applebees. As we arrived home we were surprised to find a police car blocking the intersection to our block. We slowed down, and then noticed a fire truck in front of the house. 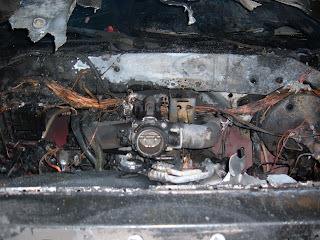 As we turned to see what was going we see that the fire was in our driveway. 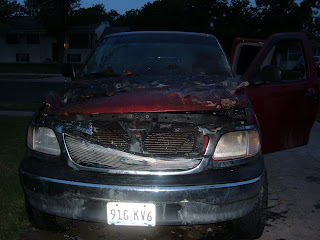 Bryan's truck had caught fire while we were gone. We are still in shock about the entire event, but we know that God was watching out for us. 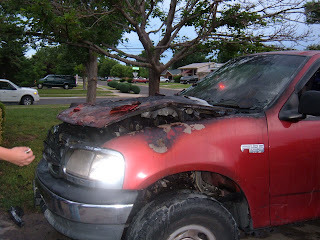 There was no damage to the house and my Expedition (which we bought last Friday) was not sitting beside the truck and therefore was not damaged. 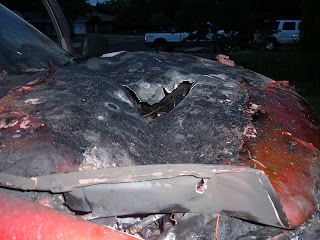 We are also relieved that we weren't driving the truck. I can't even imagine trying to get a family of 5 out of a burning vehicle. The neighbor took pictures while it was burning, so I may have more to share in the next few days. That is just so crazy. Glad you're ok! That is WILD! A couple of months ago when I was at Kohl's a lady's Cadillac Escalade caught on fire just like that a couple of cars down from mine while we were all inside the store. She said that she had just gotten her alternator replaced that day. Had y'all had any work done on it? Had he been driving it before y'all left? That is so wild! 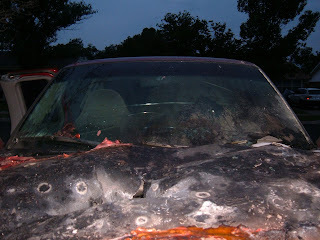 I am so thankful that y'all are ok and that the house was ok.
WOW...so glad ya'll weren't in it and that you are all safe! Keep us posted on how it happened.